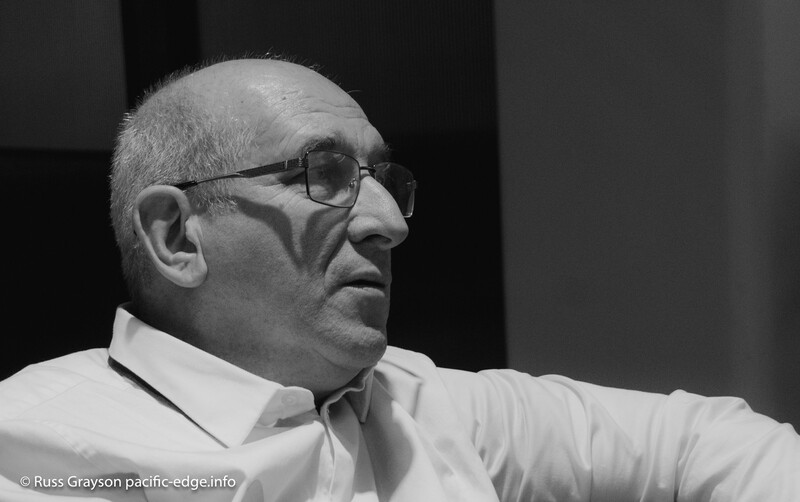 Michel Bauwens started the P2P Foundation. That was the question running through Michel Bauwens two appearances in Sydney in late September this year. If you are an early-riser you would have caught Michel at his 8am breakfast session at Parramatta. 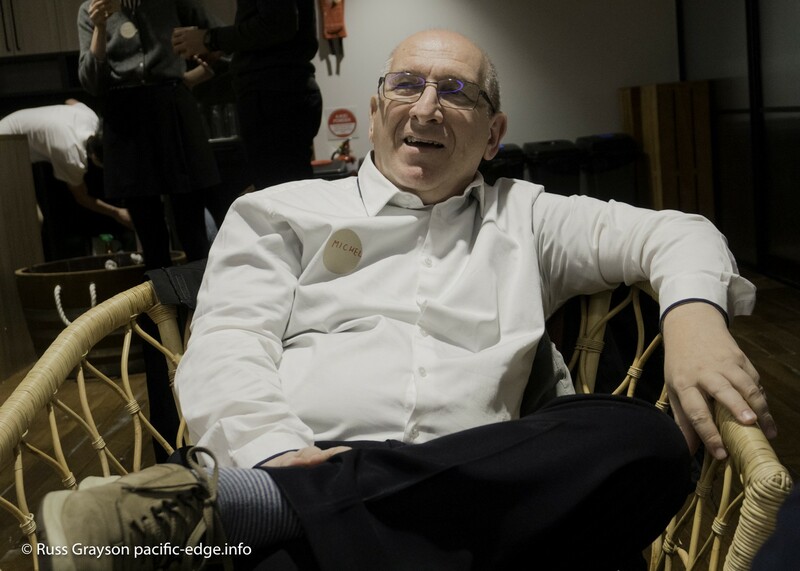 If not, there was his repeat session in the evening at the Sydney Startup Hub in York Street in the CBD. A Belgian, Michel created the P2P Foundation that researches, catalogs and advocates a commons-based approaches to social and economic change. He is perhaps the leading exponent of the commons-based economy, appearing at events around the world. 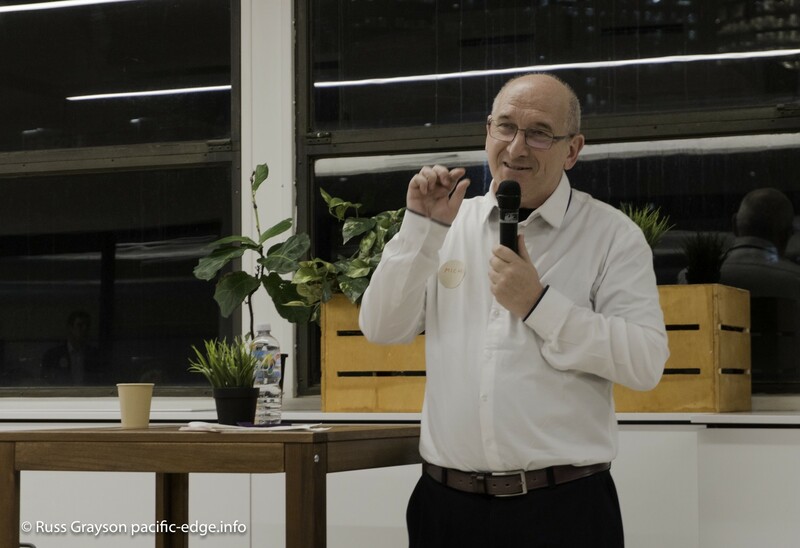 Named Common Passions Sydney: Cooperation and collaboration for resilient communities, Michel’s two events targeted the growing interest in a socio-economic third way markedly different to that of private business and government. different to government and private resources. and Start Some Good, a crowdfunding platform for non-profits, social entrepreneurs and changemakers. The event was organised by the social consultancy, In Collaboration. Standing from left: David Pointon, In Collaboration associate; Mel Edwards, UTS Centre for Business and Social Innovation; Mike Dowson, InCollaboration associate who videod the event. Seated from left: Michel Bauwens, P2P Foundation; Tirrania Suhood, In Collaboration. How do we get from winner-takes-all to everyone-has-plenty? How do we protect and strengthen our communities and care for the Earth with everything we do? How do we draw from the strengths of different organisational forms including cooperatives, non-government organisations, social enterprise and government to collaborate effectively towards the common good? These were the questions underlying the talks. Those at the launch of the Sharable Cities: Activating the urban commons book at UNSW earlier this year will remember City of Sydney councillor, Jess Scully. Jess opened Michel’s evening session. She started by asking what the commons is because the idea is amorphous or has many meaning to many people. Essentially, it is about the common good, she said, citing the tool libraries appearing in out cities (Inner West Tool Library and Brisbane Tool Library, for example). “Our tradition is that government provides public goods”, Jess explained. “However, the role of local government being eroded and this is a shift from the civic tradition”. She briefly mentioned the idea of digital sovereignty that she spoke on at the Sharable Cities book launch. That proposes we own and control our online digital information rather than give control to the likes of Facebook and Google, both datamining enterprises that make massive profits off information freely uploaded by their users, returning none of it to their users other than their search and social networking services. Jess proposed we use technologies to build the public good and that government should be an enabler of doing this. “Surplus and abundance come from human cooperation”, she said in summing up the cooperation rather than competition ethic. the urban commons — the makerspaces, community gardens, social voluntarism, civic or social entrepreneurs and the new organisations such as co-working spaces, energy co-ops, food co-ops, city farms, community-based cashless trading through mutual credit systems like LETS (Local Exchange and Trading Systems). Michel Bauwens makes a point. “The commons is a type of post-capitalism value creation”, said Michel. “It is based on open, permissionless creation by a community. Community-based projects contribute to the commons. The cooperation produces a surplus”, he said. We can make a living from that surplus of the commons that is generative, not extractive, and that returns value to the commons. Imagined as commons-based enterprise returning value to the commons, Michel’s idea becomes Bill Mollison’s ‘resources that increase with use’ (Bill Mollison co-created the permaculture design system). The problem with platform capitalism such as AirBnB, Uber, Google and Facebook is that they treat the commons as a free resource. Contributor value is not returned to contributors. ‘Open design’ makes possible local production using shared knowledge freely produced and distributed peer-to-peer throughout the commons. This is part of open source culture, part of the global sharing economy that makes it possible for people to download designs, plans and ideas, adapt them to local needs and produce them locally. Michel gave the example of computer and chip production in India. The idea is a modernisation of the concept developed by the English economist, EF Schumacher. His ‘intermediate’ or ‘appropriate technology’ has the same characteristics of local manufacture and maintenance. It is intermediate between hi-tech and low-tech and is more efficient than traditional technologies. (Schumacher wrote the classic Small is Beautiful — Economics as if people mattered). Early Christian monks living collectively in monasteries worked in the knowledge commons, explained Michel. 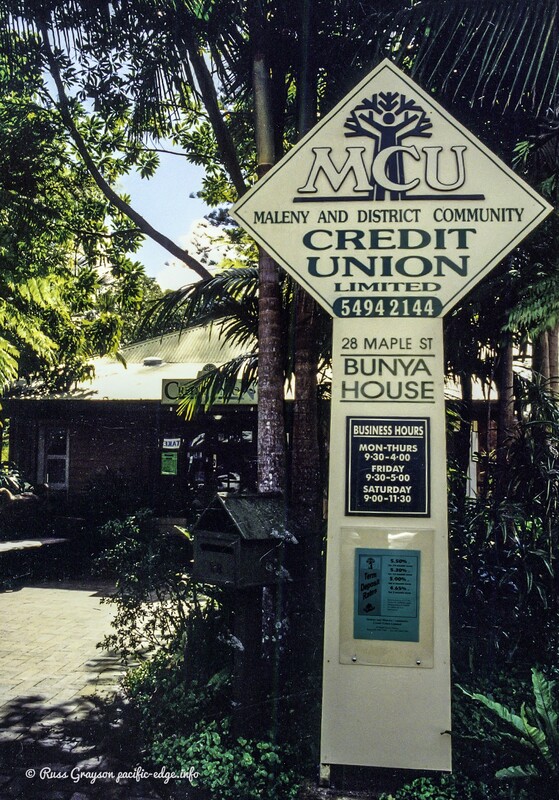 Maleny Credit Union is a local economic enterprise working in the social commons. the idea that the economy should serve the common good. 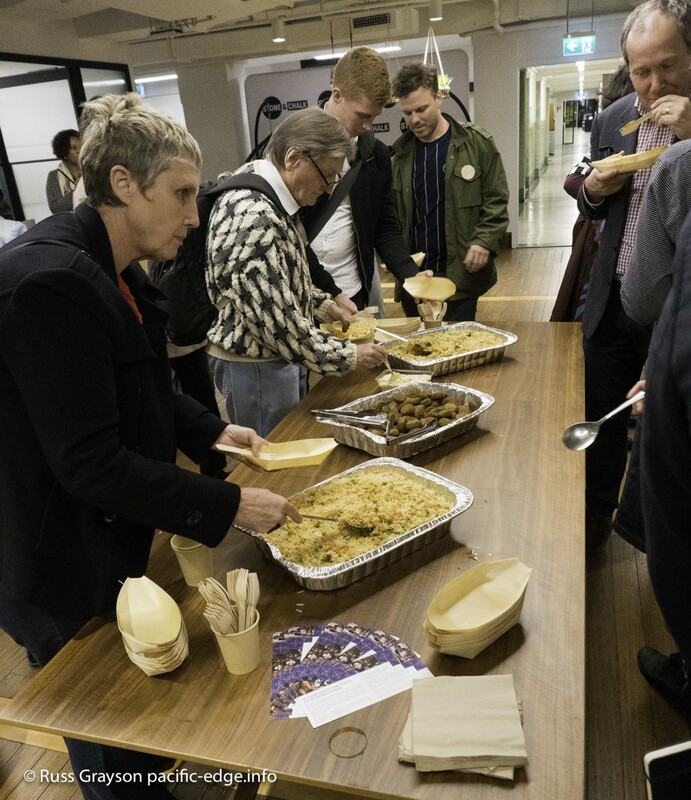 Sharing food brings people together at any event, including Michel Bauwens appearance. Just as capitalism has never been a close friend of the commons, neither has government and neither was the Soviet system, Michel said. Things are changing, however, recreating the role of government as the enabler of commoning. Michel mentioned Belgium’s City of Ghent food council and its commons park with its city farm. Government as enabler of community common property and citizens caring for commons resources gives us the opportunity to bring life back to cities, enable civic innovation and enact contributory democracy. The enabler role is one well-suited to local government. In doing this we need be wary of predatory delay by industry representative bodies. “The commons can do the job in situations of state and market failure”, said Michel in offering a social fallback position for times of socio-economic crises. Following Jess Scully’s introduction and Michel’s talk, participants formed small groups to discuss what they learned. This created such hubbub and noise that some groups had to move to the adjacent room to be heard. Michel’s ideas captured their imaginations. People were motivated. how do we bring people together? how do we develop shared alliances? ‘What next?’ is the question that hangs off the ending of many events like this. People get fired-up only to see that energy dissipate because there is no place to go to learn more or to go make something. That is why an idea of a commons school that came out of the morning session has potential, as does the question asked about building structures in which we can participate. This is about supporting the ongoing engagement of people interested in the commons and a new economy. 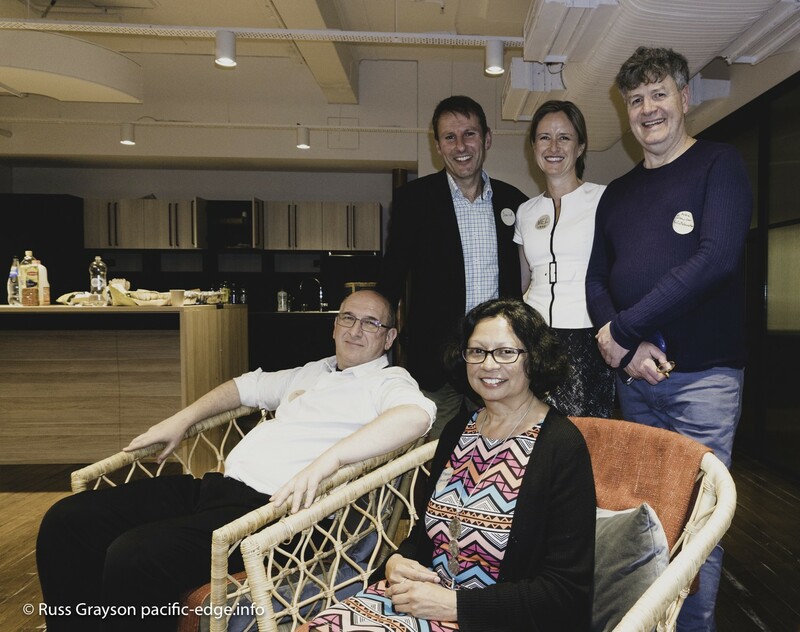 The lesson of community-based organisations and other NGOs is that a hybrid of online and face-to-face, embodied networking is essential, a hybrid that meets regularly and is open and convivial. An online conversation space in which to explore ideas is beneficial in creating engagement and coming to shared decisions. We already have the New Economy Network Australia as the venue for these online and embodied meet-ups and conversations. What would be good would be to apply the idea of forming alliances with like-minded organisations and movements. That means organisations would need to move out of their social bubbles and echo chambers and tap into a greater network in which knowledge freely flows, there to be harnessed to multiply the commons and return value to it. InCollaboration’s Michel Bauwens events were another brick in the wall of a new, convivial economy and society. They demonstrated the reality that the experience and knowledge to build the new economy already exist. We just need to get on with the job. 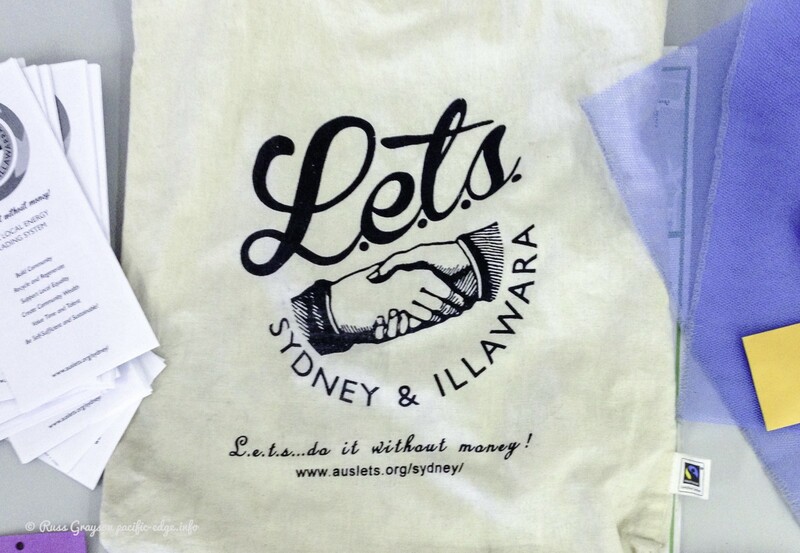 LETS is a social credit system working within the economic commons.